Margaret Atwood said in the spring, at the end of the day, you should smell like dirt. If this isn't the case, look closely at the garden, and discover why it does not beckon you outdoors. Early spring blooms, good garden design, abundant color, and a variety of textures make these 18 flower borders shine. 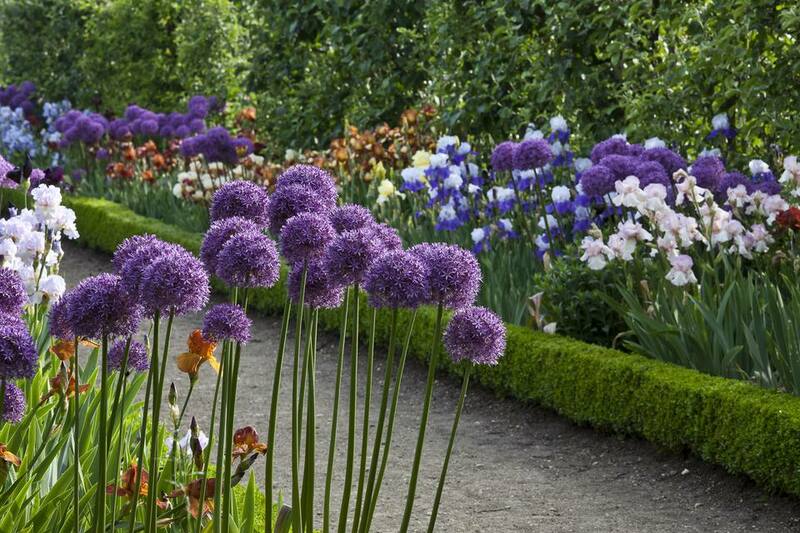 A mixed border like this one isn't difficult to recreate, even if your garden is heavy on summer-blooming perennials. The different foliage textures of the newly emerging perennials, as well as herbs like rosemary and thyme, look lush complemented by some purple alliums, yellow tulips, and bearded iris, which all bloom around early May. Your neighbor may hold the bragging rights on the earliest tomato in the neighborhood, but he's got nothing on your claim to the earliest flowers on the block, especially when you include frost-defying choices like crocus and hellebore (Lenten rose). Not all plants in the crocus genus are created equal when it comes to early blooming, so it's worth a little research into the 90 species that can grace your garden. If you become an expert, you can join other "croconuts," the affectionate nickname given to those who love the crocus. Crocus bulbs are inexpensive, and are often sold under generic descriptors like "Early Mix" or "Mixed Giants," but if you seek out named varieties and species you'll know exactly what you're getting. Crocus vitellinus is a cheerful yellow species that is a very early bloomer, typically popping up overnight as soon as the first real thaw occurs in February or March. Crocus verus 'Pickwick' looks like patches of purple seersucker cloth, drawing drowsy bees from their hibernating states for spring's first sips. The dappled sunlight under a canopy of deciduous trees that have not yet leafed out supports many early blooming plants, including easy-to-grow blue Myosotis flowers and ranunculus flowers. Plant a seed packet of annual forget-me-not flowers once, and enjoy the self-seeding volunteers for many seasons after. You can also choose the true perennial variety of Myosotis scorpiodes, which is reliably hardy to zone 3. Plant the funky claw tubers of ranunculus in the fall, and expect to see the foliage begin to emerge in March. Invest in jumbo bulbs, measuring seven to eight centimeters in circumference, and you will get up to three dozen flowers from one bulb, which costs less than a dollar. When you consider how much ranunculus flowers cost at the florist, this is a tremendous bargain. Most lawns never look better than in the spring, providing a brilliant foil for contrasting pink and purple flowers. However, vigorous grasses that intrude on flowerbeds are ugly and annoying. The best way to keep a tidy border with a combination approach that includes a physical edging like these bricks, hand-pulling, chemical herbicides, and a good layer of mulch. Delicate spring annuals like these statice and pansy plants will give you a much better performance when they don't have to compete with grass roots for nutrients, and your spring perennials like the primulas pictured will return as larger plants the following season as well. Most gardeners are familiar with the merits of Columbine, like the purple cultivar shown here, but the showy pink spikes of Dictamnus are lesser known. Also known as gas plant, a tribute to its slightly flammable fumes, you may need to order this uncommon spring bloomer from an online nursery, as they have been replaced at most garden centers by typical spring offerings like astilbe and bleeding heart. Gas plants produce similar tall flower spikes like the water hogs foxglove and black bugbane, but the gas plant is much more drought tolerant. Take care when planting in your zone 3-7 garden, as the sap can cause a rash. Choose a permanent site in the landscape, both to avoid unnecessary contact with the sap and to prevent disturbing the long taproot that forms on mature plants. Some flowers give the landscape that otherworldly, secret garden effect and candelabra primrose is one of those plants. All they ask for in the zone 4-8 garden is part sun and ample moisture, making them excellent candidates for the bog garden along with companions like forget-me-not and blue flag iris. Candelabra primroses appreciate acidic soil, and a ​top dressing of compost in the dormant season to nourish the plants. Ensure that the plants never dry out, and they will spread over the years to fill in your partially shaded garden. Arabella Lennox-Boyd entitled this landscape "A Garden for All Time" when she designed this for the Chelsea flower show. Filled with silver artemisia, purple iris, allium, orange poppies, and white ​Verbascum (mullein), this spring border is a feast of colors and textures. When a wash of pretty Easter egg colors greets us in the garden, only then can we exhale, and believe that winter has finally released its grip. With a sturdy rhododendron as the backdrop, you can experiment with more petite spring flowers like sweet alyssum, violets, dianthus, candytuft, or the miniature mat daisy Bellium minutum. Replenish the mulch between these small mounding plants as soon as they emerge and before they fill out to suppress weeds. Understated, and yet so elegant: isn't that what many gardeners strive for? However, it's easy to fall short of this goal, when faced with so many choices at the garden center. Designers Nicola Fox and Ann Kennedy created a winner with this pleasing blend of purple primroses, viburnum, lady's mantle, and clematis. A blue and yellow palette never goes out of style after a drab brown winter. Here, yellow marsh marigold Caltha palustris provides the welcome gold hues, while grape hyacinths adorn the edge and Virginia bluebells Mertensia verginica hover in the background. Be aware that both marsh marigold and Virginia bluebells are considered spring ephemeral plants, which means they usually go dormant when summer's heat sets in. Don't give the plants up for dead; they'll return the following spring to delight the next crop of bumblebees. You know that feeling you get when a long-awaited plant begins to unfurl its buds? Yes, there it goes! That feeling is particularly exuberant when it comes to a columbine plant. Unlike some perennials, like peonies, columbine plants are fast growers that will perpetuate themselves by seed. The plants aren't invasive, however, and grow between other plants without becoming thuggish. Not all perennials are created equal in the flower garden. Did you know that the difference in lifespan between short-lived perennials like hollyhock and columbine compared to long-lived perennials like the pictured peonies and iris can be measured in not years, but decades? Fortunately, short-lived perennials do ensure their placement in our gardens by exhibiting volunteer attributes, meaning they generally replant themselves by seed to guarantee an appearance in subsequent years. Make sure your peonies, like the 'Auguste Dessert' and 'Sarah Bernhardt' cultivars pictured here come back reliably by planting them in the fall rather than the spring, and by planting shallow, placing the eyes no more than two inches beneath the surface of the soil. Never underestimate the power of variegated foliage, as this April blooming combination proves. This vibrant yellow spring border includes Primula polyanthus, Primula vulgaris & Iris pallida 'Aureo Variegata,' also known as the zebra iris. Familiarize yourself with some basic Latin plant terminology, and you'll be more likely to get what you want at the garden center. It is a lucky gardener indeed who possesses both the climate and the soil to cultivate such statuesque beauties as these lupines. Cool summers and loose, sandy soil are needed to grow healthy, blooming plants. If your attempts to grow lupines fail, you can substitute the similar looking blue false indigo, which will look just as nice among the cat mint and poppies pictured here. Does your flower garden need something unusual to give it a little oomph in the spring? How about the punctuation point of flowering rhubarb? Ornamental rhubarbs may produce flower spikes as tall as six feet in the garden, and the deeply lobed foliage is highly decorative as well. Paired with purple cranesbill and a gathering of alliums, this striking late spring border is for gardeners who've moved on from daffodils and violets. Waiting for large shrubs to mature and keeping grass out of flowerbeds are yawn-inducing prospects for most flower gardeners. However, take note of the two features that define this stately spring border: the massive rhododendron framing the scene, and the crisply kept border between flowers and lawn. Focus on trees and shrubs first, and then take care of what you have. The result will be a beautiful garden. A mature wisteria can be a transforming presence in the garden if you are up to the challenge of maintaining this vigorous vine. The first step in taming the wisteria is to choose the North American native type, W. frutescens, over the invasive W. Sinensis type. Learn about pruning, training and proper support, and enjoy the plants that seem to have teleported straight from the Garden of Eden. In a world filled with misplaced garden benches, it's refreshing to see one perfectly sited in a blossoming sanctuary. This garden path has a clear destination, inviting onlookers to rest with a cup of tea and a book amidst bearded irises, poppies, lupines, and rhododendrons.